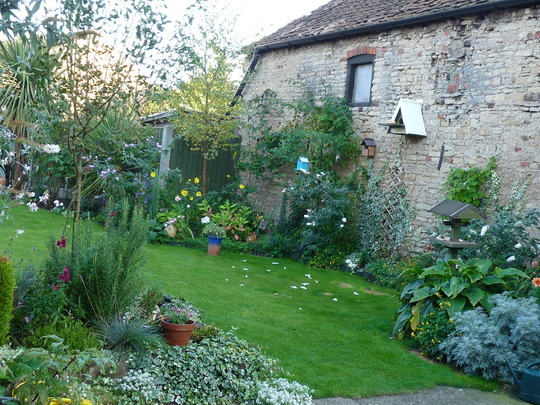 Oh lovely Jane love cottages and your garden is a perfect match! I agree Amy, keep the colour as long as possible. Looks great Janey. What a beautiful garden, so much of interest there. Is that a little owl box I can see. We get owls around here. Just beautiful Janey. Autumn is really on us now isn't it, my garden is full of leaves. Like you i'm leaving off pulling mine up, there's still so much colour and it's a long time dreary that i'm having as much colour, for as long as poss ! Though it's a sad time of the year there's still lots of colour, like the others say, hang on to it for as long as possible. Seed heads look great even though the colours are on the brown side. Echinacea seed heads are almost as attractive as the flower. You have a lovely cottage garden . Janey, I like also the old building, it looks natural like your garden. I think gardens are like shoes, you feel more comfortable in them as they get older. Heron...my left hand side border which isn't in the pic, I'm planning on making into a dry garden for next year...and Echinacea is on my wish list along with silver-leafed plants and grasses. WOW! Ali would love this as much as I do! The garden, the building....just everything is perfect. What a lovely thing to say.....thanks OB!! That old stone wall there belongs to the pub next door which has recently been bought. Hopefully they'll be opening by Xmas and want to re-roof the whole barn.....which means putting scaffold all along our side....if we're agreeable to it........AARRGH!!! You're very welcome and it's deserved too. Just love the garden, it's amazing! So many differeing gardens on here and lots of great ideas. I just need to catch up as I'm in the middle of 2 looooong weeks of work and just cream-crackered today. I'll get there though. Keep up the good work! That's a beautiful garden & stone building Janey...the pic could have come from a birthday card. Lovely. What a stunning place! I am green with envy of your walled garden! Look forward to seeing more of it as it grows! This house and garden, are to me, also a sight for sore eyes! I feel the peace and tranquility and could just sit and watch all of this beauty forever.